Recently I have taken an interest in using digital means to recount history. The thing that has taken me most is the use of old photos that are either cut into or superimposed over new photos. The results really give an insight into the history of our modern urban landscape. The Mail Online has a fantastic example of how photos from World War 2 can be superimposed upon photos of modern France, the effect really makes you think. This article has one of the original photos, the new photo and then one upon the other. 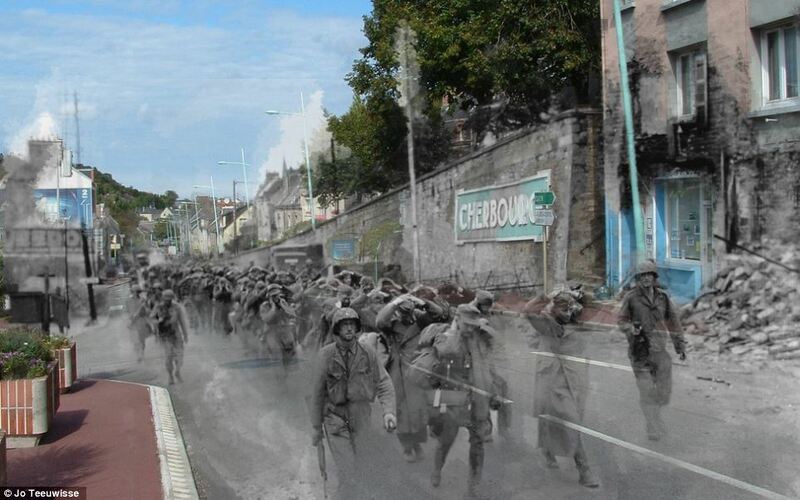 So we see soldiers battling through the rubble of the town of Cherbourg in 1944, followed by the same shot taken today and then the two merged. The obviously new addition of the cycle paths and modern signs in some way makes the photos even more dramatic, as it brings to life the reality of how we live today with the ghost of war ever present. There are 11 fully merged photos to follow, and they all tell their own story. 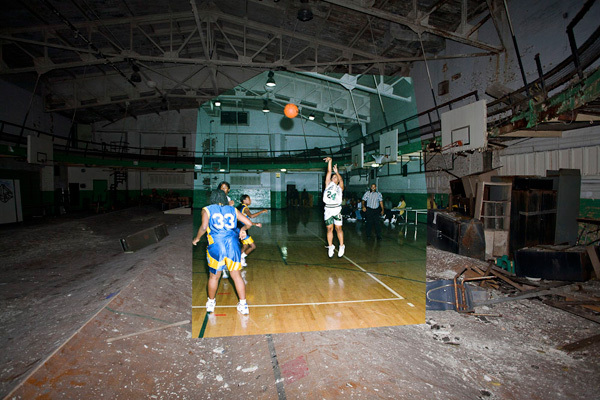 Another site that offers a wealth of photos and an incredible history lesson is called Detroiturbex. The opening photo above is taken from their website. 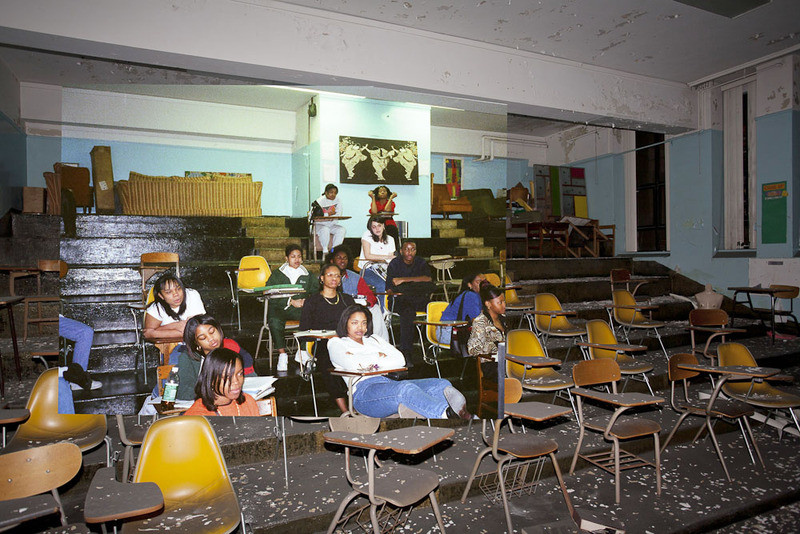 As we might imagine the project involves documenting the history of Detroit, and features photos of the city throughout its history, with a large section of connected, re-made and superimposed photos that recount the rise and fall of one of Americas largest industrial cities. To give you an idea of what has happened to this great city in recent history, in 1950 it had almost 2 million inhabitants, but today only a third of that population remains. This means that more than 80,000 buildings lay derelict. The city has been declared bankrupt so there is no money to maintain any of the structures, and the results are there for all to see. This is a big site, but a look at the index will guide you through a fantastic collection of photos, with the Now and Then section offering the matched and superimposed images. It is well worth a half hour to browse them all though, another reality of the American dream. Flickr has a group called Looking into the Past that contains hundreds of images similar to those described above, which leads me to believe that it must be quite an easy thing to do. They certainly present an interesting historical perspective upon everyday modern life. A quick search will find you plenty of others, including old postcards held over the original locations, very effective and absolutely DIY for those of us who like the analogue approach to life. This is a brilliant idea. A picture is definitely worth 1000 words in this case. 80,000 empty buildings is a huge number, this must have quite a negative impact on the population. Yes one of the main problems at the moment is that there are so many buildings that become derelict and the city has no money to look after them. this has negative effects on the community as well as the individual psychology of those living there. If you want to go and live there the city will give you a house for free if you can demonstrate that you are going to improve it and live in it, they literally cannot give them away! I want a free building! I suppose the next step is merging footage of the past with current day footage. A brilliant way to tell history.